Home » Blog » Why are Inverter Generators so Quiet? Inverter generators are known for being the quiet and lightweight alternative to conventional portable generators. But since both types of generators have a fuel-powered engine, how can an inverter generator run that much more quietly? The reason why an inverter generator is more quiet has to do with how it produces an AC current and its design features. Though both fuel-powered, inverter generators and conventional portable generators work quite differently which is why there is also a difference in the amount of noise each generator type makes. Read on to learn about what makes an inverter generator run more quietly than a conventional portable generator. Why Do Generators Make Noise? Generators make noise because of how the engine runs. The noise you hear from a conventional portable generator is caused by internal fuel combustion, the engine moving inside its casing and the generator struggling to maintain 3600 rpm. An inverter generator cuts out two of these noise making factors; the shaking inside the casing and keeping the engine running at 3600 rpm. An inverter generator is designed to have minimal movement of its parts and the technology of an inverter generator lets it run at a constant 3600 rpm. As a result, inverter generators make less noise than regular portable generators. For more information on the differences between inverter generators and conventional portable generators read this article. The main reason why an inverter generator is so quiet is because of the technology it uses to produce clean electricity. On top of that, manufacturers bank on the low noise advantage of inverter generators and so also add other noise minimizing features to the machine. First, let’s look at how the mechanics of an inverter generator minimizes noise. An inverter generator produces electricity in a process of three phases; high frequency AC current converted to DC current and then inverted into a stable AC current. DC current is a flat line which results in a constant noise level, as well. On top of that, the sine wave of the final AC current is a nearly perfect wave so in this stage there is noise control, as well. This process gives the machine more control over the power, voltage and frequency. This is why an inverter generator can run at a constant 3600 rpm and also adjust its power to the exact needs of the load. The engines used in inverter generators are generally already more quiet than the engines used in conventional portable generators. The inverter generator engines are also generally smaller with a lower power output which is another noise reducing factor. 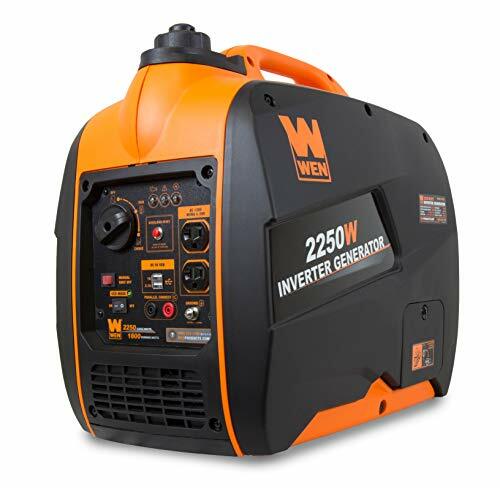 As mentioned, the big advantage of inverter generators is that they are more quiet so manufacturers try to enhance this advantage further with additional design features you would not normally see on a conventional portable generator. Even though inverter generator engines are already more quiet, manufacturers also add mufflers to the design to reduce the noise even further. Depending on the type of material used, a muffler can reduce the noise created by the engine by 10 decibels or more. Mufflers are also available for conventional fuel-powered generators but they don’t usually come standard with the design. Some generator owners also choose to build their own muffler but this is not recommended as there are many health and safety hazards associated with faulty mufflers. Aside from mufflers, the casing of an inverter generator is also designed to minimize the noise. The materials used in the design have a big impact on how the engine noise is spread. Inverter generators use special noise insulating materials. The casing is also more enclosed than that of a conventional portable generator which limits the spread of sound waves. When Is It Better to Use a Quiet Inverter Generator? Depending on where you want to use the generator, having one that runs more quietly can either be an extra comfort or a prerequisite. The accepted noise levels differs per state, housing area, national park, campsite and nature reserve. Check with your local authorities what the accepted noise levels are in your neighborhood. Though residential areas tend to accept a higher noise level than outdoor sites, not every conventional portable generator will meet this noise requirement. Since the noise regulation in residential areas is more loose than on outdoor sites, you need to decide whether the lower noise levels of an inverter generator is more important than the greater power of a regular portable generator. Outdoor sites like campsites, national parks and RV tend to have stricter rules on noise control. This is because you can disturb the wildlife in the area but also with fewer buildings around, the sound waves travel better. If you frequently go camping or stay in RV parks then an inverter generator is a safer option. It gives you the electricity that you need, is easier to carry and makes much less noise than a conventional portable generator. Can You Make a Conventional Portable Generator as Quiet as an Inverter Generator? It is not possible (yet) to make a conventional fuel-powered portable generator as quiet as an inverter generator. The main reason why it is not possible is because of the difference in mechanics between an inverter generator and conventional generator. Even with noise minimizing design features like mufflers and an enclosed casing, a conventional portable generator still makes more noise than the average inverter generator. Also, portable generators cannot be covered when running so it is also not possible to build a noise reducing case for conventional portable generators. Inverter generators are more quiet than conventional fuel-powered portable generators. This is because of the difference in mechanics but also the additional design features that manufacturers use to reduce the noise even further. Inverter generators are the safer option for when you need a power source in outdoor space like on campsites or nature reserves.